Nintendo fans spent this week in a tizzy as rumors of a Nintendo Direct newscast announcing an updated slate of 2018 games began to build. Those whispers turned out to be true, and the company published a 14-minute “Nintendo Direct Mini” this morning, unveiling a handful of titles and giving updates on several more. While it wasn’t quite as packed with bombshells as many were clearly hoping for, it nonetheless housed a few exciting surprises. The biggest news is that Dark Souls, one of the most revered games of this decade, will soon be re-released on current consoles, including the Switch, marking the series’ first appearance on a Nintendo system. Dark Souls Remastered, as its been dubbed, will include the notoriously demanding base game as well as the excellent Artorias Of The Abyss expansion. 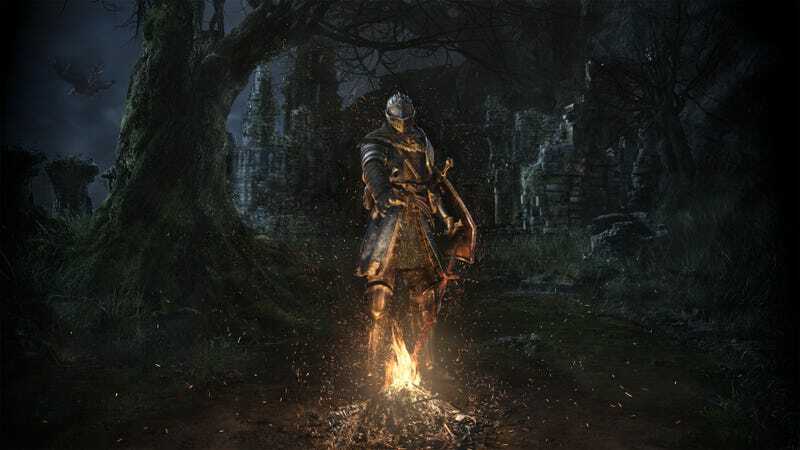 The whole thing has been given a graphical makeover and Bandai Namco promises the technical hiccups that turned players’ visits to Blighttown into a nightmarish slideshow have been smoothed over. Multiplayer options have also been expanded, so now you can have up to five other players invading your world and trying to murder you at once. It’s scheduled to release on May 25 for the Switch, PC, PlayStation 4, and Xbox One. Dark Souls isn’t the only classic RPG finding a new life on Switch. The Nintendo Direct opened with the hugely surprising announcement of The World Ends With You: Final Remix, a new Switch version of Square Enix’s beloved, fashion-forward cult hit. It’s getting remade for HD screens, and Switch owners will be able to play it with either the touchscreen (as you would have on the original Nintendo DS game) or a controller. Final Remix also includes an extra chapter, which a press release describes as “a new epilogue that sheds new light on the game’s story.” No specific release date was given, but it’s expected to launch in 2018. As for never-before-seen Nintendo games, only one got announced, and that’s Mario Tennis Aces, which is pretty much exactly what you’d expect. The big addition it has over recent Mario Tennis games is a story mode, but it doesn’t appear to be quite as deep as the RPG-like stories from Mario’s portable sports games. Aces will be served up on the Switch this spring, and it’ll share that launch window with Kirby Star Allies, which is now scheduled to land on Switch on March 16. And the parade of Wii U to Switch conversions that began last year with Mario Kart 8 Deluxe will continue with Hyrule Warriors: Definitive Edition, also set for spring, and Donkey Kong Country: Tropical Freeze, which is dated for May 4. The video also highlighted a handful of games from companies that aren’t Nintendo. First to be released will be Celeste, a new retro-styled platformer from the developer of Towerfall. It’ll be launching on Switch—as well as PC, PlayStation 4, and Xbox One—on January 25. On February 16, Switch will be getting Fe, a fantastical exploration game that’s also coming to PC, PlayStation, and Xbox. On February 27, it’ll see the release of the multiplayer heist game Payday 2. Come summer, Nintendo’s console will be getting its own version of Ys VIII: Lacrimosa Of DANA, one of 2017’s best sleeper hits, according to our own Anthony John Agnello, as well as an anime-as-hell new fighting game called SNK HEROINES ~Tag Team Frenzy~, which appears to be a spiritual sequel to the super-obscure all-female brawler SNK Gals’ Fighters. And finally, Nintendo also announced a few additions for notable Switch games. Super Mario Odyssey will be getting a free update in February that adds a weird new multiplayer mode where you can either hide balloons in the crannies of the game’s surreal worlds or go find those other players have hidden. More importantly, it’ll also come with new costumes and filters for the photo mode. Mario + Rabbids: Kingdom Battle will be getting a paid expansion that includes a new story chapter and Donkey Kong as a playable character, and Pokkén Tournament DX is getting two waves of new pocket monsters for its roster.